Recently, I came across a latest product innovation - a sticker that helps to prolongs battery life and improves performance of your smartphones battery. Improve battery life with just stickers??? What is AkkuFresh® Next Generation good for? Offers more talk time and a longer stand-by-time. Shortens charging time up to 40% / Reduces the charging frequency. Recovers worn or deteriorated batteries. / Restores the original performance. "Real GREEN Solution" by prolongs the total battery life span with up to 200% longer lifetime (total charging cycles). Protects the battery from electrical variations by regulating and filtering the current. Saves money by delaying the need to purchase new batteries. AkkuFresh® is easy to use and can easily be installed by the user. It is a small (29mm X 50mm/ 1.13in x 1.97 in) rectangular foil which is installed in seconds by the user (attached or placed on the battery). AkkuFresh® absorbs all source of energy including electromagnetic field (EMF) energy and generates negative ions for infrared waves and biorezonance. Negative ions will penetrate into the battery and create higher frequency on which the crystals resonate and burst. This cleaning process causes the battery to regain its initial capacity, and enhance the flow of negative ions. It also let the lithium ions resonate, through which an increase in voltage is obtained. Not sure how it works but according to customers' reviews, it seems to be working well. 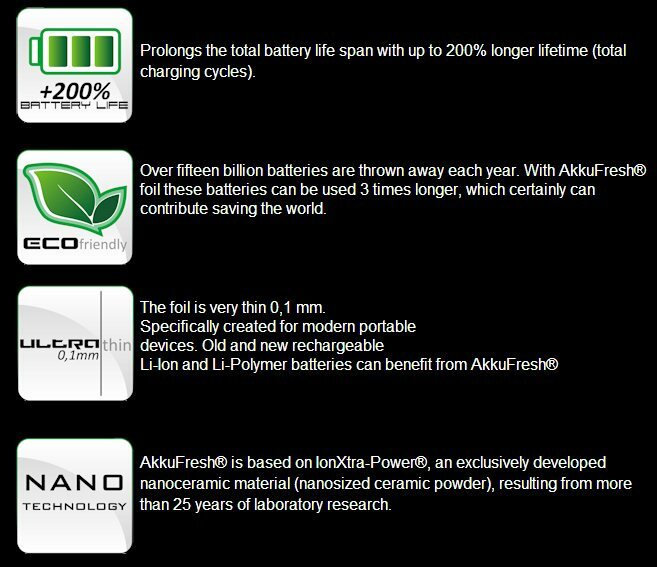 However, the seller did explain to a doubtful customer : "Akkufresh is not just a small sticker, it is foil that contain advanced technology that improve battery life and charging speed which is made possible with Nano technology. Please take note that new battery is unable to benefit from a significant improve on battery life. It would take 5-10 full cycle charge to see the optimal result. Furthermore, if the battery covered is less that 80%, it will take more cycles to see the improvement, and the results will not be as promising compared to one with 80% covered. Certain conditions as stated in our product information/brochure need to be fulfilled as well."